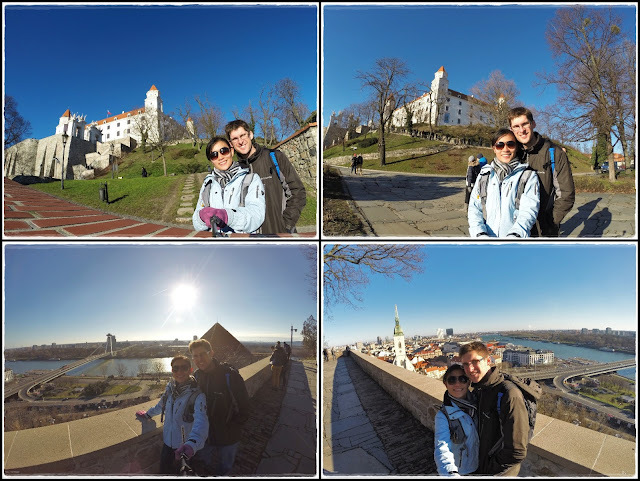 Our initial plan was to spend the day sightseeing around Vienna but after checking the weather forecast, we changed our plan to visit Bratislava instead coz it was cloudy all day in Vienna but sunny in Bratislava. Gloomy weather absolutely turns my sightseeing interest off coz it makes everything look boring and sad (you'll know what I mean in my coming Prague post). We started our day pretty late and by the time we got to the train station, it was already 10am. Bought the OBB EURegio Slovakia (Bratislava day ticket) at the train station for €16/pax, which covered our return journey between Vienna and Bratislava, and also public transports within Bratislava. Actually, nobody bothered checking our tickets at all for the whole day, even after traveling back and forth between two countries...lol! Hopped on the 10.37am train to Bratislava Petrzalka (not the main Bratislava station). The one hour journey brought us through vast farmlands and lots of windmills. As you can see, I got bored and started taking selfies...lol!! The OBB website has all the information on how to get to the city from the train station. We diverted from our original itinerary and didn't take the train to the main station, but fortunately there was free wifi at most OBB train stations so we were able to look it up before our train departed. From Petrzalka train station, we hopped on bus 80 that brought us to the city center within 10 minutes. Our first stop for the day was to hike up the castle, it wasn't a difficult hike but look at someone's face along the hike...haha!! Nice view of river Danube, UFO bridge (no I didn't come up with that name), and the old town from the castle hill. 3rd cathedral for this trip...St. Martin's Cathedral. We came earlier but they didn't allow visitors coz there was a service going on. Last stop for the day...Slovak pub...gotta try some Slovak food and beer before we leave. We were surprised that this place was crowded at 3pm, and we were a bit lost when we first got in coz the staff told us that the non-smoking area was full and just walked away after that. After looking lost not knowing where to go for 5 minutes, we decided to find an empty table sit. Glad I did some homework before coming, I wouldn't have known what to order even after reading the English menu. Btw, food here is pretty cheap. Thanks to the recommendation from this website, we ordered the traditional Slovak platter (dumplings with bryndza sheep cheese, pirogi with bryndza sheep cheese, dumplings with cabbage), Kofola (Slovak version of Coke), and Zlatý bažant (Slovak beer). Note the super huge mug of beer, I couldn't even lift it up with one hand...lol! 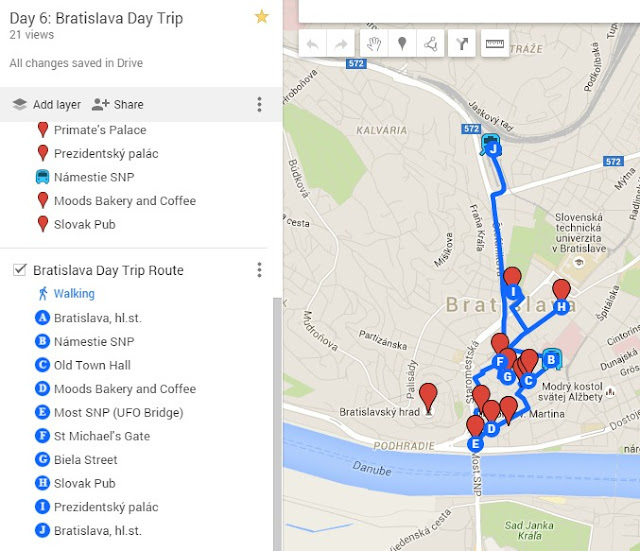 Saw the Presidential Palace at Hodžovo námestie square before take bus 93 back to the train station to catch the train back to Vienna.